The story as far as we know it, begins in Eastleach Turville in Gloucestershire, near the Oxfordshire border at the turn of the nineteenth century. Eastleach Turville is a small, quiet village where life has hardly changed over the centuries. Situated in the heart of the Cotswold's on the border with Oxfordshire it is in a farming area, away from the main roads and away from the main towns. Its main claim to fame is in the fact that it has a twin village of Eastleach Martin with its own church separated by only 200 yards and the tiny River Leach at the bottom of the churchyard and that Eastleach St. Martin’s rector, in the early 19th century, was John Keble, a leader of the Oxford Movement in the Church of England, in whose memory, Keble College, Oxford was founded. He was a popular figure in the twin villages, founding a Sunday School and often dining with the locals. The picturesque clapper-bridge between the two is named after him. As a child, Jane would probably not have gone to school, even if there was a charity or ‘Dame School’ in the village. With a large family and the very poor wages of her father, she would have been needed to help her mother to look after the others and as soon as she could, she would have been sent out to work, either doing little farm jobs or in service to one of the farmers wives. Jane and Thomas then appeared to have moved from the village. Their son, William was baptised in the May of 1818, only three months later and this took place in the parish of Charlton Abbots. On the baptism records they are described as living at Homely Hoo House although it is thought that this should probably be Humblebee How which is near the ancient Belas Knap Burial mound, between Winchcombe and Charlton Abbots. But they did not settle here. 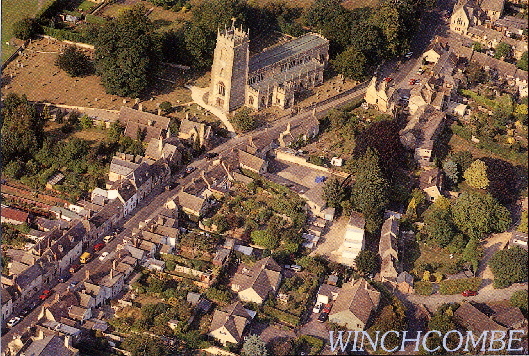 By 1820 Thomas and Jane had moved to Winchcombe probably in search of work in this much larger town, and this was where their daughter Sarah was born. At her birth Thomas is described as being a labourer. The birth of Sarah was followed in 1822 by Ann and 1824 by Mary. The children were baptised in the church at Winchcombe. 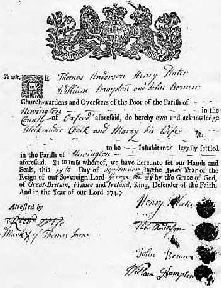 Thomas Holbrough was usually described as a labourer but Charles, another son by Thomas, would later describe his father as a blacksmith on his wedding certificate. Then in 1825 her husband died suddenly at the age of only 31. Jane, who was only 24, found herself a widow with four small children aged between seven and one, living away from her family. In 1830 Jane was living at the Oaks, Sudeley - part of the by now derelict Sudeley Estate, when she gave birth to another son, John. In the Sudeley parish records, Jane’s profession is recorded as 'a widow', the father's name is recorded as 'spurious'. What is curious about this is that at the time there was no church in Sudeley, it having been destroyed by Cromwells Soldiers along with Sudeley Castle during the Civil War. In the November of the same year, aged around 33, she married Japheth Griffin, a widower of 47, in Winchcombe church, by licence, in the presence of John Mason and Ann Griffin. It is not impossible, but seems unlikely that someone unconnected with the child would have married the mother only seven months after it's birth so Japheth remains the most likely candidate for George’s father. 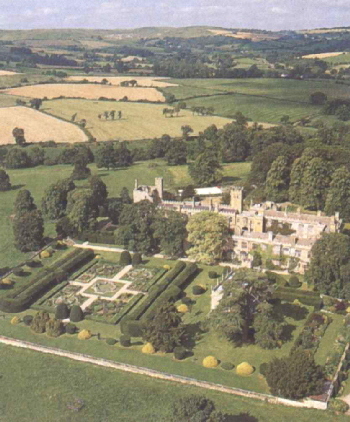 John Mason was relieving officer for Winchcombe - and apparently also for Sudeley Manor. This wedding led to a dispute between the parishes of Sudeley and Winchcombe concerning the Illegal Marrying of Paupers. Since some parishes had better job opportunities than others, it was inevitable that people would leave their home parish when times were hard, to look for employment. However, if they later became paupers, needing parish relief, it seemed unfair that their new parish should be expected to support them. This led to the Settlement Act, which declared that your Legal Place of Settlement was the parish/township in which you were born. Thus, if you fell on hard times and needed relief, your home parish was responsible for your support, and had to pay for your Removal back to that parish. You worked in the parish for at least a year. When a woman married she immediately acquired her husband's place of settlement. An illegitimate child automatically took its mother's legal place of settlement, rather than its own place of birth. Your new parish was the one responsible for your support should you fall on hard times. Before 1601, the Church was responsible for caring for the poor, but under the Poor Law, every parish was made responsible for its own paupers. An Overseer of the Poor was to be elected each year, to levy a poor rate on all householders and to give sums of money to the parish poor. Parish officers would go to great lengths to keep expenses down. In cases of female paupers, parish officers would resort even to bribery to relieve the parish, by marrying off their female paupers, especially paupers with families. They would pay for the marriage licence, for a gold ring, for the Church fees, for a marriage feast and would promise a marriage portion and pay it on completion of the marriage. When an unmarried woman was found to be pregnant, she might get the child's father married her of his own free will or under duress. If it was the parish officials that were bringing pressure to bear on him, then it was known as a 'knobstick' wedding. We the undersigned Churchwardens and Overseers of the above parish do hereby give notice that a vestry meeting will be helden in this Parish Church on Saturday the second of May next at the hour of two o clock in the afternoon for the purpose of taking into consideration and consulting on what steps should be taken upon the subject of the late marriage between Jarbeth Griffin and Jane Holbrow and on other special business, dated this 25th Day of April 1835. John Kendrick & Wm. Hyatt, churchwardens and John Cooper, Richd. Lecy, James Finch & John Mann, overseers. legal proceedings should be taken against the parish of Sudeley for a conspiracy against this parish in the illegally marrying Jarbeth Griffin and Jane Holbrow and it was agreed that Mr. Trenfield shall be the professional person employed and that the churchwardens and overseers shall be empowered to consult on the business with a committee of the five following persons; Mr. W. Townshend, Mr. Stephen Lacey, Mr. Wm. Slaite, Mr. Chas. Kendrick, Mr. Wm. Trotman as witness our hands this 2nd day of May 1835. It was agreed on likewise at this meeting that; Mr. Ned Mason shall give up the office of assistant overseer for either Winchcombe or Sudeley and he have agreed to give up his office at Sudeley and continue it at Winchcombe. It is not known what the 'Illegality' was about Jane’s second marriage but it appears to concern the intervention of Sudeley Parish, rather than being a question about the validity of the marriage itself. In 1834 the Poor Laws had changed for the worse. A year after the marriage Winchcombe and Sudeley’s new Workhouse was built - Jane had a lucky escape! Life in the Workhouse would have been very harsh with mother and children separated and the stigma hanging around the children for the rest of their life. Japheth Griffin already had five children by his previous marriage, aged between 22 and 11 at the time of his second marriage. But this cannot have been a very happy marriage as when Jane gave birth in March 1839 in Winchcombe to twin daughters, Fanny and Lucy, an entry is made in the Bishops Transcripts (copies of the Parish Registers made each year for the diocese) stating that she was 'living apart from her husband'. Sadly Frances died at 21 weeks and Lucy at 47 weeks. She was living at Footbridge in 1841 at the time of that census with two of her children from her marriage to Thomas as well as John and George. Her husband was not there and she was recorded as being the head of the house. She was working in the fields to support herself as an Agricultural Labourer. Japheth Griffin died a year later in 1842. Jane was officially a widow again. She married for a third time in 1848 to William Tarrant aged 39. On the marriage certificate Jane is shown as Jane Griffin aged 47 a widow. He too was a labourer but had served four months with hard labour in prison in 1836 for his part in a drunken riot at Winchcombe Fair. William Tarrant, William Hughes, William Hall, George Lank and John Jones were charged with a violent assault upon George Hawkes and William Kitchen, two constables at Winchcombe on the 26th march Last. The day in question being Winchcombe Fair, three turbulent men of the familiar name of Smith were 'kicking up' a disturbance near Mr. Yeens house when Kitchen, the constable, being sent for, found it necessary for the public tranquility to take the Smiths into custody; having procured some extra assistance the Smiths were taken but on their way to be locked up at the Booth Hall the 5 prisoners came to their rescue. They made an attack upon the constables, pulled the prisoners from them, violently beat them and threw stones at the officers, a mob of about 200 being collected; but the Smiths were ultimately locked up in 'durance vile'. The next morning however information was given to Hawkes, one of the constables, that some Smiths had been at work upon the outside of the Booth Hall and the Smiths had disappeared from the inside, the doors being opened by picklock keys, they were residents of Winchcombe and have not since been discovered. The defendants being called upon to answer the charge Tarrant said, "I got to say as this, Maister Hawkes is the falsest man in the court - I never struck at him, but meant to knock down John Smith", the other defendants made some bungling excuses and charged Hawkes with being drunk at one of the 'bush houses' of their company. Two witnesses were called for the defence, one of whom described a part of the 'row' but the other when he arrived at the witness box turned his head round and declined to tell his story. The jury found all the defendants guilty. Tarrant was sentenced to 4 months hard labour at Lawfords Gate; Hughes 4 months; the others (being less blameable than the two first) to be imprisoned 2 months to hard labour. At the 1851 Census Jane was living back in Winchcombe in Gloucester Street; with her new husband and her two illegitimate sons, John and George. She was still in Gloucester Street by the time of the 1861 Census of Winchcombe but by now her children had left home. She died and was buried in Winchcombe as Jane Tarrant on the 21st of May 1864.